General Observations: By November we are getting late into fall and temperatures are falling below freezing many nights. WWCFM has ended with the exception of their pre-Thanksgiving market, and Summit ends the sunday before Thanksgiving as well leaving only Hopewell after that. November is the last month of the regular season and the crew must work through the colder weather and darker days to ensure there is produce for the remaining markets. Also, preparations for winter must be made to the farm. Last November also saw the beginning of a Winter Production Season as a special project by RCM and ST.
Administration 72.5 hrs: With the weather getting colder and the day to day workload on the farm lessening, November was filled with plenty of office work. On 11/9 accounting data entry was introduced and reviewed for ST and RCM. The checkbook and Quicken procedures were gone over, including file management, data entry, reports, corrections & splits, and finding and imputing income & expense data. On 11/10 ST finished entering checkbook data into Quicken and the approx. figure of $104,000 in expenses to date was calculated. Recommendations for saving money were discussed. On 11/11 CH did payroll. 11/21, a note in the log discusses the end of the primary market season and the beginning of the winter production season as well as noting lots of admin work to be done. On 11/21 MR did payroll and ST entered market date into Quicken. 11/30 meeting to discuss the past season as well as the new winter schedule. Winter hours would be Tuesday and Wednesday plus self directed work anytime with the priorities of chores, winter season tasks, marketing, cropcare/infrastructure, and a heavy load of 2009 monthly and 2009 and 2010 season summaries to be published on the website. Infrastructure 47.5 hrs: Colder temperatures dropping below freezing on some nights necessitated some infrastructure work to prepare for the cold. On 11/2 ST and RCM received an introduction to turning the farm’s water system on and off as well as draining it. This process of draining the farm’s water system overnight and turning it back on when necessary would continue throughout the month. With winter production on-going in the greenhouses some rodent pressure was discovered and dealt with, rats were trapped on 11/5 and 11/8, a note in the log suggests looking into rat stew recipes. Chicken chores continued throughout November, with the 09 flock moved into Veg A North for pasture. The composting toilet was also cleaned this month. On 11/4 replacement batteries for the JD were purchased. The IH140 was used to bed form in Madonna Field North in preparation for Garlic planting, furrows were cut and then compost added. On 11/18 the JD had difficulty starting, battery dead and heavy drain on new batteries. Started after being hooked to charger in the AM and ran fine. Diagnosis was that there is a short somewhere in the ignition system and the solution is to disconnect the batteries when not in use. 11/24 JD used to load compost for Ralphs house, battery disconnected after use. Greenhouse 34 hrs: With winter production on-going much work was being done in the greenhouses, requiring daily management for temperature control. In addition to the daily greenhouse chores, on 11/11 RCM tightened up the heated greenhouse and noticed a broken heating pad smoking when plugged in. Composting 21 hrs: Compost was applied to 8 beds in Madonna Field North in preparation for Garlic planting. Ralph’s house also received a treatment of compost in preparation for WP plantings. Planting 47 hrs: Garlic was cleaned on 11/12 in preparation for planting, yielding 85 lbs of prime garlic cloves for seeding. The planting took place on 11/16, 8 beds were planted with a single row of Garlic, the curved side of the clove facing the bed’s edge to insure uniform stem alignment. There were two groups of plantings in the heated greenhouse for WP in November, one on 11/9 into bread and tomato trays and another round on 11/18 into flipped seedling tables lined with chicken feed bags with soil on top. 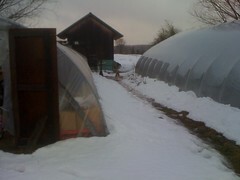 Both plantings contained field salad, arugula, tatsoi and peas. Crop Care 50.5 hrs: Remay management was a large part of crop care in November. 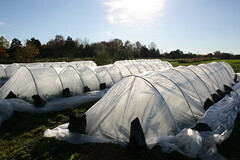 Plastic/Remay tunnels for winter production needed to be regularly managed to insure temperatures did not stress the crops. This process meant opening the ends of the tunnels for cooling during the day and closing them at night. A note in the log demonstrates the necessity of the regular management, when it was discovered that when opening the tunnels at 10AM the temperature was already 90*F when the high for the day was only 55*F. On 11/11 the tomato patch was cleaned up in the field, and greenhouse tomatoes were cleared from Ralph’s house by 11/24. Harvesting 186 hrs: Arugula, Beets, Carrots, Chard, Field Salad, Kale, Peppers, Radish, Tatsoi, and Turnips were still being harvested in November, as well as a diminishing amount of greenhouse tomatoes until finally the plants were removed on the 24th. Handling 54.5 hrs: Only 2 weekly markets for the month of November and Summit ending the Sunday before Thanksgiving meant less washing than in previous months. Special Projects 47 hrs: A note on 11/21 marks the end of the primary market season and the start of RCM and ST ‘s winter production season. The winter production special project which had been in planning and initial preparation before, was now getting much more daily attention. Plantings in the heated greenhouse and management of the remay/plastic tunnels were a large part of this, as well as harvest and handling for the Hopewell market. A summary of last year’s winter production special project is available here. Week 1: Freezing nights, milder days. Rain on the 4th. Week 2: Cold, temperatures around freezing at night, but sunny with highs around 60 most of the week. Week 3: Warmers nights, temperatures in the 40s. Strong winds blow through on the 17th, 35mph+ followed by a drop in temperatures. Week 4: Cold nights continue, with forecast lows below freezing for the start of December. General Observations: Winter is coming!! That is what was on everyone’s mind this month. All three markets that north slope attended were still in full swing and therefore produce needed to be available. With temperatures dropping crop health was a concern. Measures were taken to regulate crop temperatures in the field and all of the greenhouses were prepped and planted for winter production. With winter coming clean up around the farm and creating proper storage spaces were also high on the task list for the crew. Equipment 16 hrs: With winter coming the crew focused on necessary repairs and finding appropriate areas to store equipment. Started setting up “have–a-heart” traps in greenhouses to catch and remove groundhogs that were destroying green house crops. Administration 54 hrs: There were a lot of administrative completed this moth with winter and the end of the season approaching. 10/1 crew meeting was held to discuss midseason check in, plan for third year interns and setting priorities. Manager met with each of the third years to further discuss their specific focuses. 10/5 Crew was given overview of what tasks needed to be prioritized for the month; work that needed to be done to prepare for winter production, tasks that still needed to be completed in both the greenhouses and fields, taking down tomato stakes and strings, weeding strawberries and blackberries, covering crops, equipment clean up and storage for coming winter months. The usual administrative tasks, payroll, accounting and bills were attended to as always. Infrastructure 55hrs: Weekly chicken chores, moving coops, cleaning coops and adding new bedding. 10/13 mowing 579 diversions and field perimeters. 10/19 Old chicken pasture was mowed. 10/27 Started mowing the BGB not in production. Seed shed cleaned. Greenhouse 10.5 hrs: Winter production seedlings were moved into the greenhouse and tables rearraged to accommodate trays. The green house gothic was seeded on the 6th for winter production. Composting 0 hrs: Received a load of fresh compost on 10/1. Planting 15.5 hrs: 10/6 greenhouse gothic was seeded for winter production 10/21 transplanted rudbeckia in tea garden 10/22 finished planting perennials in the tea garden. 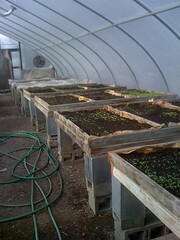 10/25 turnips and radishes were transplanted into the hoop house for winter production. Crop Care 113 hrs: Weeding as always! This month all of the crop care was focused on prepping for winter production. See “special projects” for further details. Harvesting 293 hrs: Chard, kale, beets, turnips, salad mix, green beans, arugula, tatsoi, last of the flowers (sunflowers, zinnas, and marigolds), tomato production decreased as the month progressed but still able to consistently harvest from both the field and the greenhouse. 10/6 crew was unable to harvest kale for Hopewell market due to rain damage. 10/15 Low yield of salad due to slower regowth, arugula showing cold damage. Handling 68.5 hrs: Regular washing in preparation for the three markets NSF attends. Special Projects 56.5hrs: This month most of the crew’s efforts went into preparing for winter production. The crews intent for winter production was “to extend the growing season of greens, lettuce, and roots to serve our existing markets; Hopewell Farmers Market, Nomad Pizza, and Zone 7.” 10/5 all of the seedlings for winter production were moved to the green house due to cooler weather. 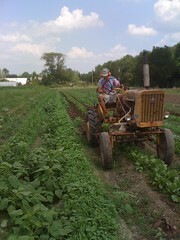 10/8 Remey was brought out to cover 2 rows of chard, and beets and one row of kale. The crew determined that a single row of remey measuring 72″ was the easiest to manage. 10/13 Rebar was cut in 12 foot lengths and covered in recycled drip tube to span over BGBs. Each tunnel was covered with an outer skin of 6 mil plastic (13′ wide x 50′ long). 10/14 5 field tunnels at 40′ were covered and anchored with sand bags. 10/15 Strong winds pulled tunnel edges loose. Crew decided to shovel divots to set sand bags in to prevent bags from slipping on sloped edges of the beds. More sandbags were placed on beds to better secure plastic. The total remay coverage was WP tunnels (40′): 2 tatsoi, 1 arugula, 1 spinach, and 1 new planting of arugula. BGB with plastic: 4 salad mix (2 unharvested beds and 2 regrowth). Field beds with Remay: 2 chard, 2 beets, and 1 kale. 10/21 The crew observed temperature changes in the low tunnels. Opened one of the beds all day and recovered at 4pm found that temperatures reached 80°F. Left one of the beds closed all day temperature reached 100°F. Conclusion was that the low tunnels must be opened during the day and closed at night. 10/27 Crew observed that there was substantially more growth on the covered crops compared those that were left uncovered. An inner layer of remay was added under the plastic to the 4 beds of salad mix in anticipation of cooler weather. The addition of the remay was to help reduce temperature fluctuation. 10/28 The 2010 chickens were given a treat, 4 cups of first sprouted grain. 10/29 remey was placed over turnips and radishes in Veg B south. General Observations: September seems to be another month of transition. As May marked the transition from greenhouse production and season preparation to full scale production, September marked a return to the greenhouses and preparation for winter production as the last of the field successions were planted at the end of August. September is a busy month, with many priorities vying for the attention of the crew. Harvesting the remaining field successions was a key priority, as was harvesting the tomatoes which continued to yield through the month but at a reduced yield later on. In addition preparation for fall greenhouse crops and the planting of cover crops for the winter need to be done. Also, winter production was on everyone’s minds as NSF trainees were allowed to plan out and begin working on the various elements of winter production with the goal of providing fresh organic produce to our local Hopewell Market throughout the winter. On top of all this the daily chores and other needs of the farm mean that in worker hours September 2010 was the highest of the year with 1064 total hours. Administration 52.5hrs: For administration September started with a Farm Review in the log on 9/1. Notes in the log talk about focusing on harvesting from the final field succession and a planting frenzy for direct seeded crops before the new moon on 9/8. The standard administrative duties were also performed, payroll and bill paying. Planning for winter production was another administrative project that took place last September. Interns RCM, ST, and SJ took on many of the planning responsibilities for winter production including the creation of crop plans, strategy/bed choices, seed and supply orders. On 9/29 MR trained SJ and ST on field layout and primary tillage of Madonna Field as it was divided into 3 blocks to be added into the field rotations allowing for a full season fallow for each block every other year, a bioextensive method to prevent soil from being overworked. Infrastructure 70.5hrs: Mowing with Kabota and bushhog, diversions mowed 9/6 and 9/21. Field perimeters, as well as Veg C and D field were mowed. Chickens: The new 2010 flock was moved into the old 2008 flock pen. The 2009 girls were moved to a fresh pasture. 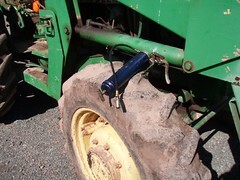 Upon removing the backhoe for the JD tractor a leaky hydraulic hose was discovered on 9/1. On 9/15 the log mentions that there was trouble starting the JD which was solved by adjusting the charger and dosing the starter with ether. Greenhouse 10.5hrs: Cleanup and bed preparation were the focus of greenhouse activity. The Farmhouse Gothic greenhouse was prepared for a direct seeded winter production crop, after a normal bed preparation procedure of composting, broad-forking, and rototilling the beds were irrigated to flush weeds before seeding a week later. Composting 21hrs: Compost was sifted for greenhouse winter production seedlings. On 9/21 NSF received delivery of approx. 35 cubic yards of mulch. The big garden beds and greenhouse beds received compost prior to planting. Planting 53.5hrs: On 9/1 two beds of salad were planted without composting or broadforking with a note in the log to observe the success of the crop without those preparations, however the follow up note was not found. Arugula and Tatsoi seeded for the new moon on 9/8. Spinach on 9/9 and carrots and radishes seeded in Ralph’s House GH on 9/11. Two more beds of salad were planted in the BGBs on 9/15. 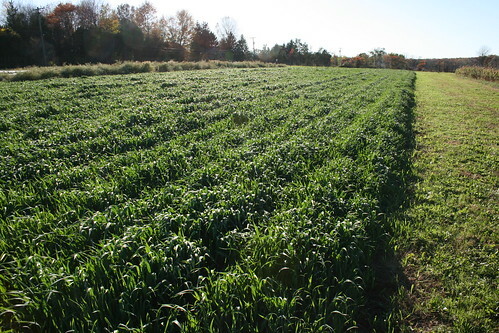 Crop Care 155hrs: With fall almost here and winter following quickly behind getting cover crops planted and established is an important task in September. On 9/2 and 9/3 Veg B North was seeded with a cover crop of wheat and Veg B Mid was bed formed and seeded with white clover in the pathways and broadcast with oats. The practice used in Veg B Mid was particularly useful as the formed beds held their shape through the winter and could be planted in the spring without additional bedforming. Regular weeding in the BGBs and field throughout the month. The Asparagus also got some attention and was weeded on 9/16. Harvesting 376.5hrs: Chard, Kale, Beets, Summer Squash, Peppers, Eggplant, Radishes, Field Salad, and Flowers continued to be harvested. On 9/14 the first of the winter squash was harvested. Radishes were cleared and topped on 9/16. The experimental corn plot was harvested on 9/21, yields were disappointing due to drought, for 12 field beds of corn approx. 20lbs of corn was harvested. The tomatoes continued to yield through September, however at a decreasing rate. The strong storms on 9/30 flattened lettuce and led to a lower yield of salad for the two weekend markets that followed; 14lbs. compared to 92lbs. the previous week. Calculations regarding the garlic crop were made, ¼ acre yielded 1,750 cloves of garlic or 50 lbs. bulk/ 44 lbs. cloves. Handling 75hrs: Regular washing in preparation for the three markets NSF attends. Garlic was also cleaned, roots cut off and dirt removed from bulbs. Special Projects 64hrs: The 2010 chickens got a treat when prime galensoga weed was harvested for them to eat. Rock Road East deliveries continued with the Farm Stand in offering fresh organic produce to our neighbors through September. And of course the TOMATO FIGHT took place 9/12, with lots of “fun, pizza, beer, and rotten tomatoes”. Nomad Pizza supplied the delicious brick oven pizza. 2010 Tomato Fight t-shirt sales plus contributions helped to cover the costs to NSF for hosting the event, our 5th Annual Tomato Fight. A note in the log about the tomato fight claims ST and RC “obviously were the best” and should have won awards. Weather: Conditions throughout the month remained dry, and for the most part hotter than average, continuing the two month drought that the area had been experiencing last year. Week 1: Hot and Dry weather, with the temperature some days reaching above 100*F. Hopes that Hurricane Earl passing off the coast will bring some rain do not pay off. Week 3: Cool, still dry. Despite last week’s storm only .6” of rain have fallen since late August. Week 4: The heat returns. 93*F and still dry, although forecast storms finally arrive on the last day of September and deliver a stormy first day of October. General Observations: When I think of July, I think of sitting on the porch after a long day of with my hand wrapped around a cold drink. And I imagine that’s just what the crew did last July after a long day’s work. With a massive heat wave and drought that brought 99-100 degree days, threatened crops and changed work hours to a 6am start up, a bit of relaxation must have been necessary. Thankfully, however, July didn’t seem to be all that bad. The month brought along the first exciting harvests of tomatoes, sungolds, eggplants, carrots, cucumbers, and garlic. Chickens were taken care of, equipment problems seemed minimal, the 3rd succession of crops was planted, and other issues seemed to find quick solutions. Equipment 20 hrs: July seemed like a month with few equipment problems. The John Deer had a bit of trouble starting one day which postponed composting and planting in a field. MR fixed it later that day with a jump start from the Ford and the battery charger. There was also mowing going on early this month. Maintenance was necessary for the Farmhouse and Ranch yards, waterways and for the cluster area. Field beds were also mowed down. Administration 13 hrs: The website had some difficulties working and delayed the posting of the July 2009 summary. (The 7/09 summary eventually got posted. Just scroll down and click on “next page” until it pops up!) Other administrative duties included payroll, bill-paying and the quarterly tax statement. Non-financial tasks were out of the ordinary. MR gave a two hour tour to farmers from Philadelphia on 15th. On another day, someone stumbled upon the old North Slope Farm logo on the computer and had plans to revive it. Infrastructure 38.5 hrs: Our chickens were movin’ on up. The older girls got moved to fresh pasture. The young gals were given a new home in a bigger coop, within which, they were described as, “content and adventurous.” Heat and drought made bringing water to both groups of chickens a critical task. The office and shoop (an equipment storage facility), including the compost toilet area, received a clean-up and it was discovered that the shoop needed a new cover. Greenhouse 2 hrs: Ralph’s house (the name of one of our greenhouses) was home to the tomatoes and some garlic beds last year in July. This particular greenhouse was cleared of weeds as workers harvested garlic. The remaining tomatoes received constant trellising. Composting 7.5 hrs: The field we know as Veg B South had six beds composted in total in preparation for planting the 3rd succession of crops. Fruit trees such as the Asian Pears and Clem. trees also got composted. Planting 21.5 hrs: The 3rd succession was planted by CH, SJ and ST. Crops included the transplanting of basil, fennel, red beets and zinnias on 7/2 and gold beets on 7/6. The 4th and 5th successions of field salad were direct seeded on 7/6 and 7/28, respectively. CropCare 134.5 hrs: Weeding, weeding and more weeding. 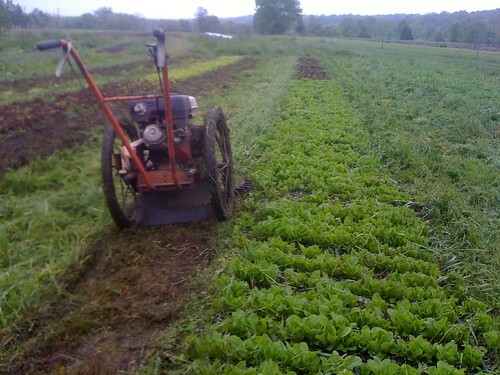 One bare-fallow field needed a hard weeding down the center of its beds after several passes with mechanical cultivation. Doing so was noted to promote less weedy beds for next year. Another bare-fallow field was weeded of big plants and then needed weeding of the smaller plants. Experiments regarding weeding and worker hours were conducted. It was concluded that worker hours were less when weeds were smaller in size. It was also concluded that philosophical discussions made the work go faster. Harvesting 312 hrs: Last July they harvested: Kale (285 bunches), Scallions (176 bunches), Squash (396 pounds), Garlic (6 rows), Radishes (56 pounds), Zinnias (169 bunches), Tomatoes (25.5 trays), Sunflowers (39 bunches), Greenbeans (263 pounds), Field Salad (300 pounds), Sungolds (284 pints), Cucumbers (205 pounds), Carrots (184 pounds), Eggplants (64 pounds), Flowers (500 bunches). Handling 66 hrs: The walk-in cooler was broken! RCM had a difficult time moving crates around and finding storage. She eventually settled on using the display cooler for blueberries. Dried loose-leaf tea was packaged and the harvested garlic was cut and stored. Also, ST, RCM and SJ received a detailed flower harvesting introduction. Fun handling observation: 17 pounds of wet salad mix becomes 12 pounds of salad mix after spinning! (5 pounds of water spun out). Marketing 141 hrs: Garlic, cherry tomatoes and tomatoes were sold wholesale to Nomad last July. The Farmstand was also open and its revenue for the month totaled $297.00. Each week there was any combination of chard, salad, snow peas, scallions, beans, garlic, squash, eggs, blueberries, beets, cucumbers, sungold cherry tomatoes, and other tomatoes. Other markets are West Windsor, Summit and Hopewell. Special Projects 9.5 hrs: Some of the fruit trees, sadly, did not do well in the heat and had passed on. Another special project involved discussing the future of our website. General Observations: This month was all about switching everything into full gear. A lot of time spent establishing the grain fields now known as the Madonna field. A large amount of equipment training was given to the crew because of this task. 15 consecutive days without rain in hot conditions made irrigation a huge priority and management concern. Many hours were spent preparing beds to be planted. Harvesting time doubled and more time was spent handling the produce since the second market of the season started this month. Harvesting 272hrs: 6/15 peas harvested, tracked time/yield and then established wholesale value;first week there was no chard due to infestation of leaf miner; 6/30 had to use box truck to store bulk items becaue the walk in cooler was not working; harvest time doubled this month due to the start of our second market at Summit. 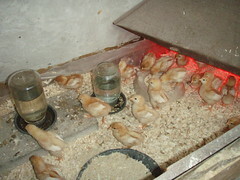 Special Projects 10.5hrs: 6/11 hay was cut in the 579 field, 6/22 new batch of chicks picked up. General Observations: May was a very busy month. In worker hours it was the second highest of the year with a total of 1051 hours. Spring is in full swing, the vegetation around the farm is growing heartily and the weather is getting warm enough for outdoor planting to proceed as the risk of frost diminishes. With increased production comes an increased need for maintenance. Crop care, harvesting, handling and all the other elements are affected as more is being grown. May marks a shift in priority tasks, crop care and keeping on target with succession planting must take precedence while basic operations cannot be neglected. The result of this is a busier time as the farm shakes off the last of winter’s sleep and launches fully into the season’s production. Administration 59hrs: The regular tasks of accounting and paying bills were attended to, as was payroll. A rainy morning was a good time for a crew meeting to discuss priorities for the month. MR reviewed by-laws and vendor regulations in preparation for a Hopewell Market Meeting. On 5/19 an accident report was made, the Hay Rake was crashed into and severely damaged by a car/truck. Infrastructure 150 hrs: Lots of infrastructure work this month, by worker hours May was the heaviest of the year for infrastructure. Moving and caring for the poultry was a weekly chore with the chickens out in the field. Having the chickens in the field certainly improves their quality of life, but also exposes them to danger as was seen twice this month in fox attacks. On the 11th 7 of the ’08 chickens were lost, and on the 22nd 9 more were lost. With everything now green and growing, maintenance of pathways and waterways became a larger task. In addition to maintaining the key arteries of the farm, beds needed to be mowed in preparation for planting. Also in May, the pool was swept and prepared for use. On 5/23 a problem with the farm water system was discovered, a burnt wire was found in the well pump control unit. Resetting the system frequently proved ineffective, and on 6/2 a repairman came and repaired the well. In the mean time the farmhouse water system was used to fill in as best as possible, but with some inconvenience. Equiptment 90hrs: Lots of equipment training this month, second year interns SJ ST and RCM were trained on various equipment/practices including rototilling, tilling, disking and cultivating with a tractor. The Kubota was serviced on 5/13, problems with the starter were troubleshot. A note in the log suggests the blades be replaced by this time next year. JD received new application of Teflon tape which leaked at first but then held after tightening. Greenhouse 69.5 hrs: With so much of the farm activity shifting to planting and crop care there was much less going on the in greenhouses this month compared to the last. By mid-month only one bed of Swiss Chard from last fall remained in Ralph’s house, the rest of the winter production was cleared. Tomatoes were potted on and more plants seeded for seedling sales. On 5/30 the need to prepare for the seeding the next succession was mentioned in the log. Composting 43hrs: Plenty of composting as field beds were being prepared for planting. BGBs and field beds being readied for planting received one trailer load per bed. Blackberries received a covering of mulch. Planting 116 hrs: Lots of planting this month, with a heavy focus in the Big Garden Beds. There were two plantings of salad mix in May, as well as the planting of mixed beds of radishes with carrots and turnips with carrots. On 5/21 tomatoes were planted, in one long day of hard work all the available varieties were planted out in the field. About 100 each of Sungold, Brandywine, and Striped German as well as smaller numbers of Arbason, Crimson Sprinter, Corsalo, Cheroke Purple, and Green Zebra made it out into the field for the first time in their cowpots. On 5/25 some of the second succession was planted; Squash, Chard, and Zinnias in Veg B north. Harvesting 129 hrs: May marked a change in harvesting as the greenhouse production came to an end and was replaced by crops from the field. Salad mix, Arugala, and Chard were harvested from the BGBs at first, with Kale left to grow larger. By the end of the month kale, garlic scapes and turnips were being harvested for market. Handling 48.5hrs: Regular washing for markets, eggs washed for Bent Spoon. Strawberry plants potted on 3 to a container for sale at market along with other seedlings. Market 118hrs: May 1st was the first of the Saturday markets at West Windsor, which meant now North Slope Farm was harvesting, preparing, and attending two markets a week. Seedlings helped to bolster market revenue and notes about selling out in the log indicate that overall markets this month went well. CH also set up a farm-stand file and spreadsheet to track deliveries, the farm-stand was cleaned up and display cooler turned on. Special Projects 29hrs: Hay cutting in 579 field. Cost calculations for poultry production were made comparing Winter and April feed costs to eggs produced. The cost per dozen eggs of WP was calculated to be $2.39 vs AP costs of $1.57 per dozen eggs. Week 1: May started off hot, 90* on the first of the month. By the end of the week however the weather had changed and conditions were windy and cold. Week 2: Much colder, with some rain. Frosts overnight on the 9th and 10th caused some crop damage, loss of 50 pepinos noted in log. Week 3: Continued cold this week, with some days of heavy rain. By the end of the week conditions were sunny and warm again. Week 4: Warm and sunny for most of the week, conditions allowing for the tractors to get into the fields. Some heavy rainfall arrived at the end of the month, just in time to prevent the need for irrigation being used. General Observations: As a new trainee at North Slope Farm, I learned that last April was filled with all sorts of excitement. The weather was interesting as the month started with a sunny heat wave followed by a thunderstorm that led to dry, cooler days the rest of the month. So much cooler, in fact, that there was a frost warning on the 23rd. Weather didn’t stop production, however, and among the usual tasks that accompany the start of a growing season were challenges, experiments and special projects. From equipment repair to greenhouse issues, newly planted fruits to chicken coops, the crew was kept on their toes all month. Equipment 26 hrs: Minor issues with the JD tractor on the 7th resulted in the creation of a sheet of instructions regarding where to grease the zerks. The same tractor had problems toward the end of the month when it started leaking hydraulic fluid. On the 8th, a tire for the Kabota was repaired and put back on. An old trailer was resurrected from weeds and given new tires. Its purpose is to carry a water tank to water remote fields. Finally, the ATV had work done on its ignition system. Other tractors were used to mow the Market Garden and Grain Field. Administration 54 hrs: Summaries for April and May of 2009 were started and finished during this month. Other administrative work included correspondence with CowPots early in the month regarding certification potential, and orders of organic corn seed and tomato grafting clips. Also, a cost estimate data for the BGBs and Top Dressing Garlic were created on the 8th. Infrastructure 78 hrs: The water source and system changed this month, and a fence was taken down around the compost. Irrigation was created for many areas on the farm including the strawberry, arugula and lettuce beds, as well as the fruit cluster and the Farmhouse Gothic. Later on, the strawberries got a new supply line so it didn’t have to keep switching with that of the Gothic. Finally, the permaculture field, once overgrown with brambles, saw an amazing transformation after being mowed on the 29th. Greenhouse 110.5 hrs: It was a rough month for the greenhouses. An aphid infestation overwhelmed the Red Russian Kale in Ralph’s House. Plants and planted tomatoes (Taxi, Paragon, Arbasen and crimson summer) were removed from R.H. on the 14th. On the 23rd, snails were found to have eaten 65% of the planted tomatoes on the east bed of R.H. and those tomatoes were replaced. A possible solution to the problem would be to feed the snails beer. Composting 47.5 hrs: The fruit cluster, apple trees, garlic in the 579 Field, the BGBs and Veg B North all received a layer of compost. Planting 171 hrs: Many crops were seeded, direct seeded, transplanted and potted this month. Most notable plantings were the Chester Blackberries along the north edge of the composting area, 9 more apple trees on the South East edge of the fruit cluster. Planting of grapes and Hardy Kiwi also garnered excitement from crew members. April also held the seeding of the 3rd and 4th succession of seedlings for sale at markets, planting of crops for the Kitchen Garden and the 1nd succession of veggies on the 8th. CropCare 151 hrs: Tea plants were weeded and peas were trellised. Beds were prepared for arugula and lettuce. This included, mowing, forking, tilling, raking, rolling and finally seeding the field. The 579 field, which had garlic planted, was cultivated, composted and mulched. A threat of frost on the 23rd moved the outside tomatoes and flowers into a truck. Harvesting 21.5 hrs: Swiss chard and salad mix were harvested for market sales this month. Handling 2 hrs: Chicken eggs were washed and packed on the 16th. Marketing 53 hrs: North Slope Farms participated at the Wednesday Farmer’s Market at Hopewell (?) during this month. Some days were better than others in regards to sales and turn out. Both factors seem to be correlated with the weather… such as less people coming to the market during a thunderstorm. Produce continued to be delivered to local restaurants this month. Special Projects 99 hrs: The lucky girls had BD building and improving on their homes (chicken coops/tractors) the entire month. And a routine for chicken chores was either created or reviewed on the 20th. General Observations: Spring is coming. Looking back on last year’s log reminds me of the somewhat chilly start we had: snow on the grown, freezing nights and some windy wet days. But soon the weather began changing and warm temperatures by the afternoon kept our spirits up as the green began appearing. Chickweed salads with the fresh tangy green were enjoyed by crewmembers. Of course this spurt of green growth also meant there was plenty of weeding and such to start off our season and prepare for. Fortunately, after a long winter off, the NSF crew was ready to get our hands dirty again. Administration 126.5 hours: Numerous ’08 summaries had yet to be finished and posted on the website and the general crop plan for the current season needed to be smoothed out and seeds ordered. A lot of time was spent in the office trying to get ready for the coming season… which on a cold wet day in March can be very pleasant when sitting next to a small heater. There were also bills and payroll to be paid and general organization of farm business. Infrastructure 67 hours: General repairs on the farm after the winter had to be done. The seed shed foundation was fixed up and stuccoed, helping make the root cellar more efficient, protecting the Insulation Boards. Loose roof panels were repaired, as was damage from the winter and a rain/wind storm to the greenhouses. Power supply line to Greenhouse #1 was protected with Electrical Conduit. Composting 14 hours: Lots of sifting compost for our seedling trays. Planting 44.5 hours: Began planting some perennial Fruits, strawberries, blackberries and asparagus. Also seeded peas. Crop Care 63 hours: Beds needed to be prepped after the long winter, both in greenhouses and in the field. Everything from clearing beds of weeds, broadforking, rototilling and seeding. There were lots of beds in the tea garden and market garden that had to be cleared. Lettuce grown in the heated greenhouse during the winter was transplanted into a bed in the unheated Ralph’s House. 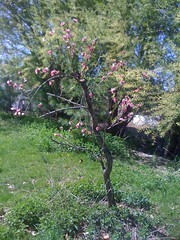 Fruit trees were also pruned. Handling 6 hours: Cleaning products and prepping for our weekly Hopewell market. Special Projects 36.5 hours: Chickens needed a new traveling coop built for the young 09 girls. Egg washing and finding enough egg buyers in the winter (through wholesale to the Bent Spoon in Princeton).